Huge and thorny, jackfruits have a sweet, tasty surprise inside. This tropical fruit is characterized by sweet arils (bulbs) that are packed with dietary fiber, energy, and vitamins and minerals. What’s even better is that these are free from saturated fats and cholesterol. Jackfruits are believed to have anti-cancer properties because of the presence of antioxidants, phytonutrients, and flavonoids. Antioxidants help fight free radicals to prevent cell damage. Healthy cells are important because it allows your body to resist diseases. DNA damage to cells are typically the cause of cancer cell growth. Jackfruit’s sticky and starchy properties make it a good colon cleanser. Additionally, nutrients present in jackfruits help protect the heart. Vitamin B6 reduces homocysteine, a common amino acid obtained from eating meat. Increased levels of homocysteine can result to cardiovascular disease. Potassium, on the other hand, helps regulate blood pressure. Jackfruits are abundant in magnesium. This nutrient is essential in promoting bone density, strengthening bones. Another important nutrient is manganese, which is vital in regulating blood sugar levels. This reduces your risk of contracting diabetes. You can also prevent thyroid problems by including jackfruits in your diet. These are high in copper, which regulates proper hormone production. Copper is also beneficial in producing red blood cells. Consequently, it helps the body absorb iron more efficiently, thus helping prevent and treating anemia. Jackfruits can also prevent macular degeneration and cataracts. They contain vitamin A and other antioxidants that promote proper eye health. These fruits are also, surprisingly, a good cure for asthma and other illnesses that affect the respiratory system, like the common colds and infections. Jackfruits can give the body a substantial amount of vitamin C to fight colds and strengthen the immune system. Your entire body will benefit each time you eat jackfruit. You can have healthier, stronger hair thanks to its vitamin A content. You’ll also have a glowing complexion thanks to jackfruit’s detoxifying properties. Don’t forget its effect on your eyesight. The dietary fats present in jackfruits are good for the digestive system. Jackfruits have anti-ulcer properties, removing toxins from the colon, and preventing colon cancer in the long run. It also functions as a laxative, helping you improve bowel movement and fix constipation. Antioxidants present in the fruit help boost your immunity. A strong immune system will help you stave off common diseases like colds and flu. In the long run, you will also be able to prevent cardiovascular diseases, diabetes, and cancer. Jackfruits are known to maintain normal blood pressure and blood sugar levels. You can enjoy jackfruits as is but you can also find delicious ways to cook these delicious treats. Here are some jackfruit recipes to inspire your inner chef. 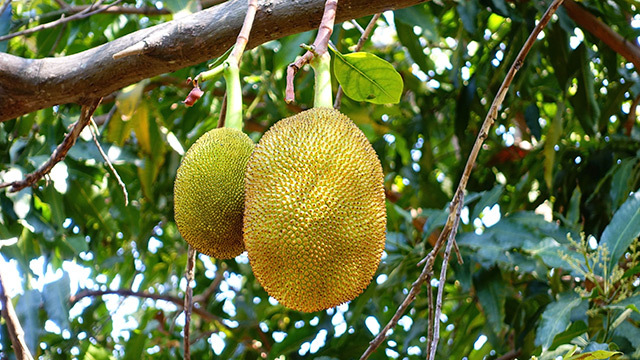 Jackfruits promote healthy skin and hair. Jackfruits can improve your vision. Jackfruits can prevent macular degeneration, colon cancer, anemia, and cardiovascular diseases. Jackfruits treat asthma and constipation.